I tried out the simple three-step Shine Booster treatment last week and - despite being sceptical of inferior "salon-inspired" DIY products - ta-dah, luscious locks indeed! 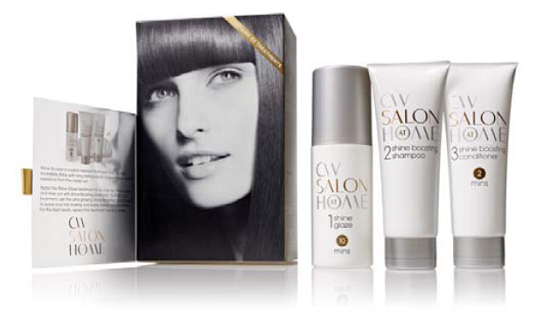 The kit comprises a shine glaze, shampoo and conditioner containing a unique blend of natural oils called Luminoil Complex™ which penetrates the hair cuticles to boost radiance from the inside out. The packaging states that there is enough for four washes, but as I've got super thick and long hair, I reckon it'll only last two or three weekly uses. Still, comes in at a snip of salon prices and as tired, lifeless, lacklustre hair simply will not do for the party season, this is a great inexpensive product for soft, glossy and smooth hair.